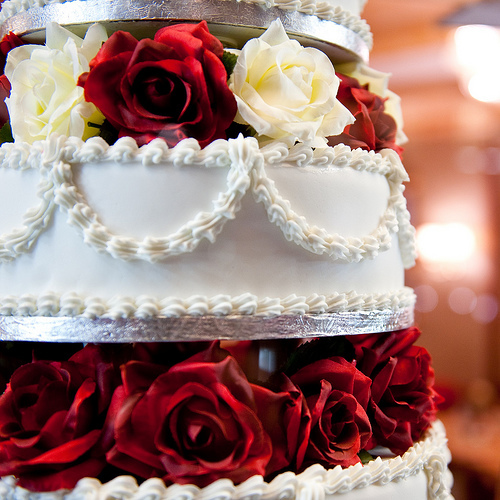 Wedding cakes with fresh flowers are naturally beautiful. 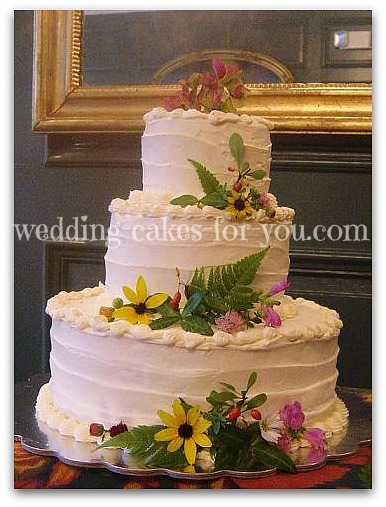 Wedding cake flowers can simply be hand picked from your garden. 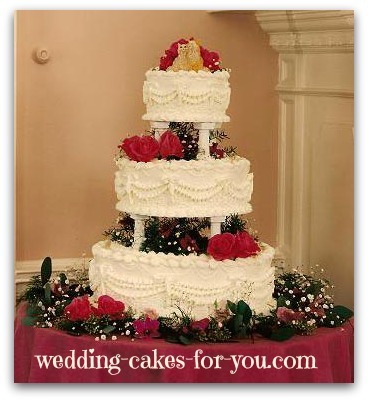 Elaborate wedding cake roses and other types of flora and fauna can be purchased through a florist or even online. 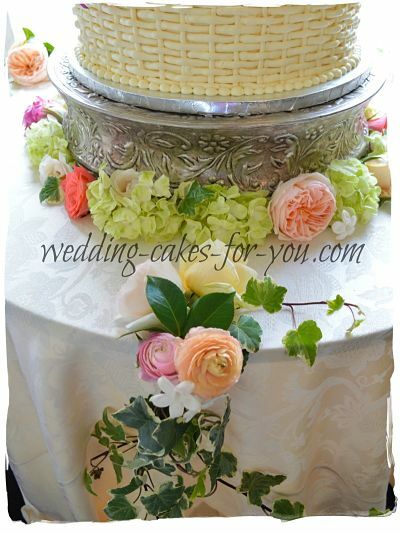 With this Nantucket style basketweave cake below I got lucky because the florist at the venue supplied these gorgeous Roses, Ranunculus, Stephanotis, Morning Glory and Hydrangea for me to decorate with. This 4 tiered cake is made using Wilton Plates and 7" Pillars. Each tier is set upon a plastic plate which is fitted to the pillars. If you use 5 inch pillars in between each tier there will be less space to fill. To see an example of this style cake with 5" inch spiked pillars go here. 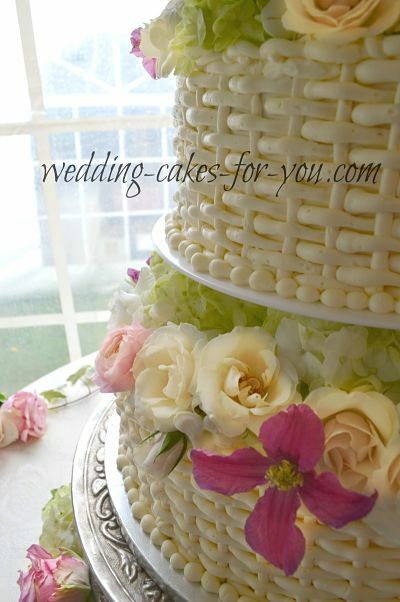 A slide show of current pictures of my work and more wedding cakes with fresh flowers. The square wedding cake was a chocolate buttermilk cake with a mocha buttercream and chocolate chip filling. Yum! The bride and groom chose an elegant yet slightly whimsical look for their cake. The buttercream is textured using a spatula and the borders are ruffles piped on with a pastry bag using a large leaf tip. 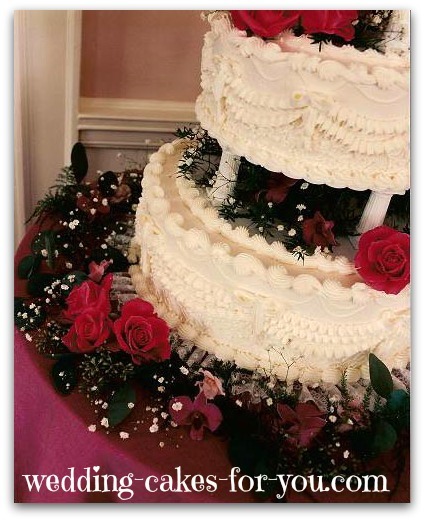 Click on the image to see a large version of the cake pictures on this page. I call this design Victorian because of the intricate lace and ruffles piped onto the side of the cake. The red roses add to the Victorian look. Pink or yellow roses would work beautifully too. 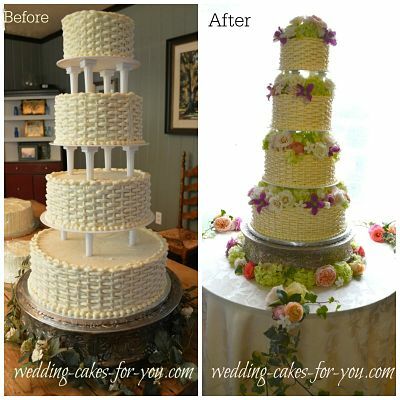 This is a pillared cake using 2-1/2 inch pillars which you can get at any decorating store, or right here on this website. Wilton is usually the brand that I rely on for my decorating supplies. you may have a local craft shop to get your supplies from. 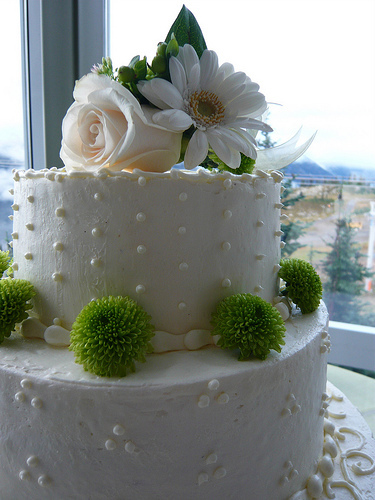 If you are doing cakes in bulk than you will want to buy your supplies at a wholesale supply company. Link to supplies page. 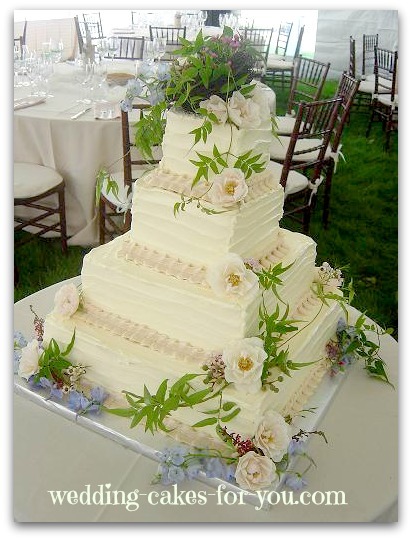 This wedding cake is so simple and elegant. The sides are decorated with groups of dots piped on with a pastry bag using buttercream, the border is simple shell. 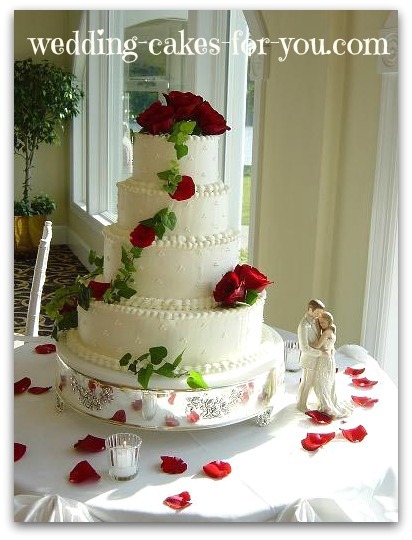 The bride and groom topper is placed to the side among the rose petals for an added look of elegance. The silver base is a very beautiful and simply elegant display piece that you can purchase online. 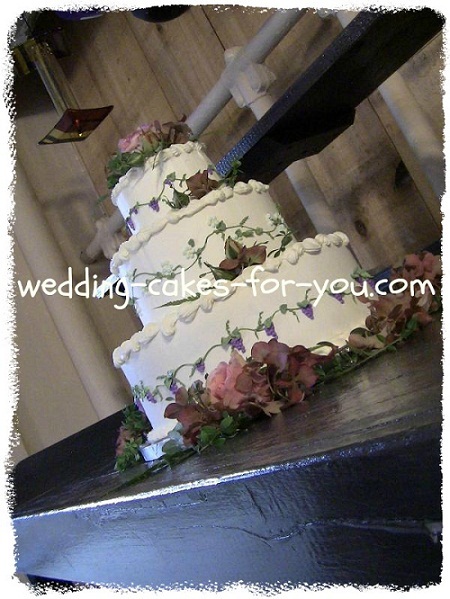 Fresh flower decoration is my favorite, especially when the flowers come straight from the garden to the cake. That was the case with this awesome cake. The flowers are edible Nasturtiums from my own garden mixed with roses and greens. The top decoration is made from wire with little dots of royal icing to form a spray, a Wilton inspired idea that I have used several times for a dramatic effect and to add height. 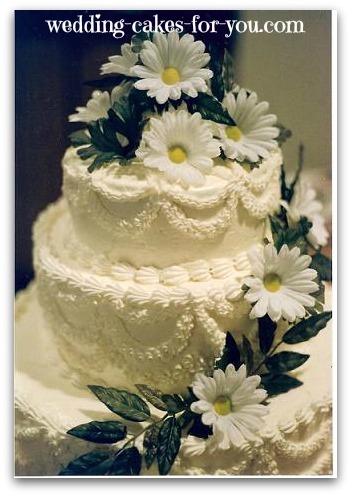 Daisy wedding cakes are perfect for a simple outdoor wedding or for country western style wedding cakes. This one is made with silk flowers because it was used as one of my many dummies display purposes. 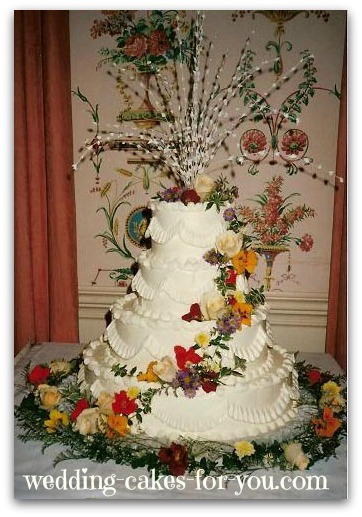 A dummy wedding cake can also be used at a reception. Some brides may opt for this, using a sheet in the kitchen for cutting and serving to the guests. Roses and a simple garland butter cream decoration. This design is simple yet elegant with a dotted swiss buttercream decoration and a few scroll designs on the bottom tier. The green mums add interest. Courtesy of Wordridden of Flickr. 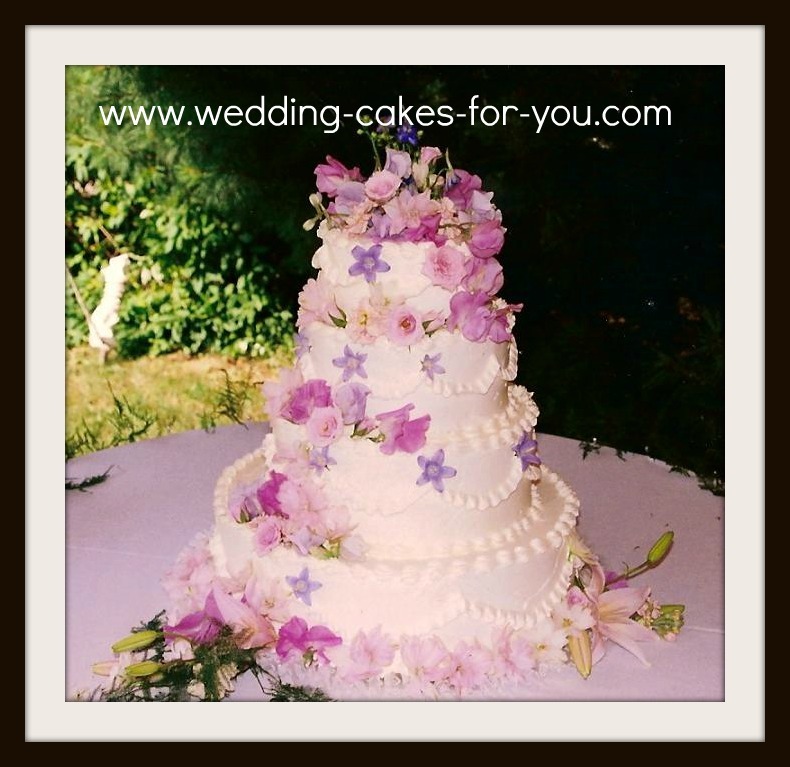 A very plain buttercream cake made beautiful with fresh pink and purple flowers. Fresh flowers from the meadow are all that is needed for a simple design like this one below.